One of the most beautiful cartographic representations of Southeast Asia ever printed. Le Royaume de Siam avec Les Royaumes Qui Luy sont Tributaries & c. / La Royaume de Siam avec les royaumes qui luy sont Tributaires, et les Isles de Sumatra, Andemaon, etc. Et les Isles Voisine Aven les Observations des Six Peres Jesuites Envojez par le Roy en Qualite de Ses Mathe : maticiens dans les Indes, et a laChine ou est aussi Tracee. La Route Qu'ils ont teniie par le Destroit de la Sonde Jusqu a Siam. A fine example of Joachim Ottens' magnificent two part c. 1710 map of the Kingdom of Siam and its tributaries. Covers much of Southeast Asia and the East Indies including modern day Thailand, southern Vietnam, Cambodia, Malaysia, Singapore, Borneo, Sumatra and Java. This remarkable map was one of the largest and most detailed maps of this region to appear in the early 18th century. It was drawn by Joachim Ottens shortly before his death and was published by his sons and later republished as a single sheet map by Covens and Mortier. The upper map focuses on the territories currently occupied by modern day Thailand, Cambodia, Vietnam, northern Borneo, and northern Malaysia. Offers wonderful detail the Andaman Islands, the Gulf of Thailand (Golfe de Siam) and coastal Vietnam. Also has good detail along the navigable inland river systems, particularly the Mekong and the Chao Phraya. In the Kingdom of Siam, this map shows the fortress of Bangkok, the ancient Siamese capital of Ayutthaya, royal palace, and the Dutch trading colony. In Cambodia, it details the village of Ponompingn (Phnom Penh), Lewek on Camboia, and the Dutch trading mission. In the seas this map offers numerous depth soundings and shows the trade routes between Batavia (Jakarta, Java) and Siam (Thailand). Also details the shoals and reefs off the coast of modern day Vietnam. Mountain regions are shown pictorially. Title in French across the top of the map, outside the neatline. 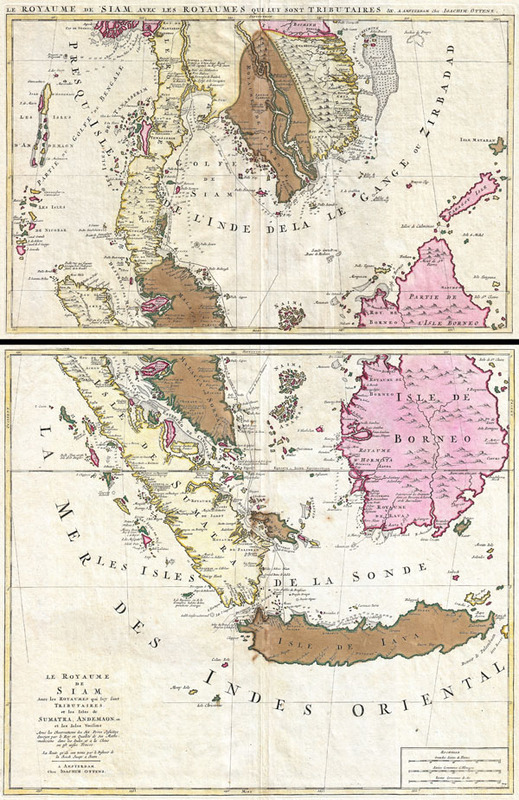 The bottom map details the southern parts of the Malay Peninsula, Sumatra, Borneo and Java focusing on the Straits of Singapore (Cingapura). Does not specifically name the Island of Singapore, but does show the island that would fatefully be settled in 1819 by Sir Thomas Stamford Raffles. Offers superb detail along the coasts naming numerous forts, trade missions, settlements and islands. Shows the trade routes between Siam and Batavia and illustrates some of the hazards of the Straits of Cingapura (Singapore). Offers numerous depth soundings along the western coast of Borneo, the northern coast of Java, and western Sumatra. Mountain regions are shown pictorially. Title in French occupies the lower left quadrant. Joachim Ottens (1663 - 1719) and his sons Renier (? - 1750) and Joshua (? - 1765) Ottens were prominent Dutch booksellers and map publishers from about 1680 to 1790. Joachim, the founder of the firm, was initially employed as a copperplate engraver by Frederick de Wit. In 1711 Joachim founded his own firm. Though Joachim died only a few years later, his sons Renier and Joshua took over the firm and presided over its most prolific period. The Ottens family's most notable contribution to cartography were its enormous made-to-order multi-volume atlases such as the Atlas Major. Some examples of the Atlas are compiled from over 800 separately issued maps. This map set would have been compiled into one of the Ottens' made-to-order atlases such as the magnificient Atlas Major. Very good condition. Light overall toning and very minor offsetting. Original centerfold. Original color. Platemark visible on both sheets. Wide margins. Blank on verso. Koeman, C., Atlantes Neerlandici. Bibliography of Terrestrial, Maritime and Celestial Atlasesand Pilot Books, Published in the Netherlands up to 1880, (6 vols), Vol. II, C&M (80), p. 75. Parry, D., The Cartography of the East India Islands, Insulae Indiae Orientalis, p. 177. National Library of Australia, MAP RM 184.